Late summer camping in Northern Wisconsin can be filled with peril. As the days stay warm and the nights get cooler insects like yellow jackets and wasps increase their activity, looking for sweet eats to prepare for the winter ahead. But here’s a simple solution you can use to draw them away from your picnic table and trap those pesky insects. Most wasp traps work on the concept of the funnel. Put a sweet attractant in the the bottom of a container and make the entrance curved so that they can fly in, but can’t find the exit out. But you don’t have to buy a fancy trap to catch them, just build your own out of a used plastic water bottle. Take one 16.9 ounce water bottle and cut the top off just above the label. The the top around and push it into the bottom part of the bottle, creating a funnel. Then fill the bottle with about one inch’s worth of sweet liquid like Mountain Dew, orange drink, or another sweet, brightly colored soda. Soon the wasps will hover, crawl in and get trapped. They do crawl up the insides of the bottle, but will never seem to find the exit in the middle. Soon they fall to their death, drowning in the liquid. 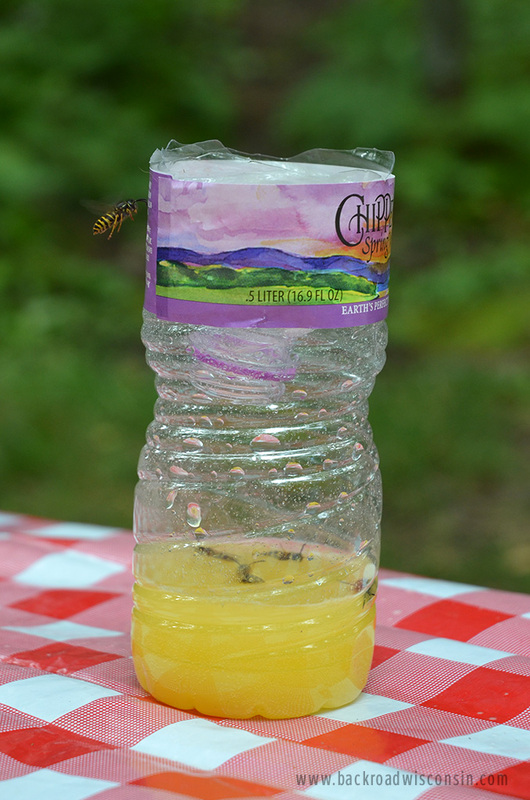 Once the bottle is full, you can either throw the whole thing out, or flush the dead wasps out and reuse it. We left our trap out on the picnic table and soon had over a dozen trapped within a few hour’s time, making the campsite much more comfortable.